Thank you to the Vermont Agency of Agriculture for highlighting Vermont Tree Good’s work on Earth Day! Check out the article below, or visit their website. On April 22, 2017, millions of people around the globe will gather to promote awareness of the environment by celebrating Earth Day. The Working Lands Enterprise Initiative values environmental stewardship and, in recognition of Earth Day, would like to recognize Vermont Tree Goods, a 2015 recipient of a Working Lands Grant, for the work it does to celebrate Earth Day, every day. 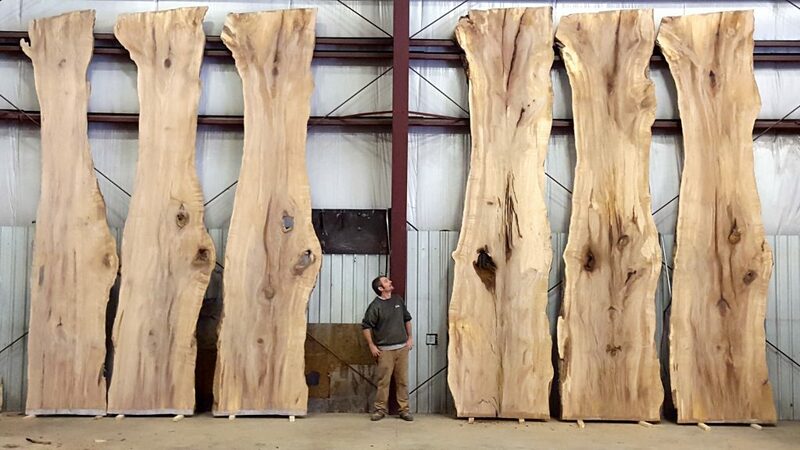 Vermont Tree Goods mills planks and creates furniture from recycled heirloom trees that have reached the end of their growing years. In 2015, the company received a $20,000 Working Lands Enterprise Fund grant for equipment capable of milling larger lumber at twice the rate. Due to this grant, Founder John Monks’ dream of creating natural furniture with sustainable building materials was realized. On November 1, 2016, Vermont Tree Goods oversaw the taking down of a historical tree—the tree believed to be the largest Slippery Elm in the northeast—in Charlotte, VT. The elm had died from Dutch Elm Disease and was reportedly 19 feet, 4 inches in diameter and 109 feet tall. At its sawmill in Bristol, Vermont Tree Goods milled the elm logs into planks which were kiln dried and brought to life once more in distinctive furniture. “We have developed a milling technique that not only allows us to cut the largest of trees, but also uses far less energy to do so. The carbon footprint of our furniture is smaller than that of all others. With our focus on efficiency and sustainability, we are the epitome of a “green” business. To us this is just being conscious in all that we do. For you it means loving your furniture and your planet – smart,” says Monks. Although Monks is passionate about the environment and keeping trees alive through his furniture, he is equally passionate about the work being done by Nature Conservancy’s Elm Restoration Program to develop elm trees resistant to Dutch elm disease. “It is more than just saving the species. The Elm also plays a huge role in flood control and maintaining our water quality. That’s why the Nature Conservancy is planting them along the Connecticut River. The way I see it, it is a Win-Win-Win situation for all parties involved,” says Monk. And because he believes in the cause, Monks is donating a portion of sales from each item made from the Slippery Elm Restoration Program so the Nature Conservancy can continue its important work.